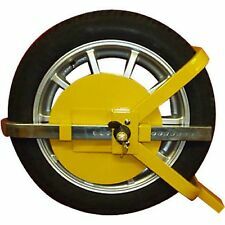 Maypole Mp9065 Universal Wheel Clamp 13" - 17"
Maypole Security Universal Motorcycle Car Caravan Claw Jaw Wheel Clamp MP9075. 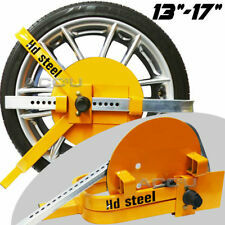 Car Caravan Van Trailer 13" - 17" Wheel Clamp. High security, pick resistant lock, dust water & corrosion proof. Security plate prevents access to wheel nuts. Suits wheel 13" - 17", with tyre widths up to 215mm. Heavy duty car van truck caravan vehicle lock wheel clamp is a perfect anti-theft device to keep your vehicle safe and secure. 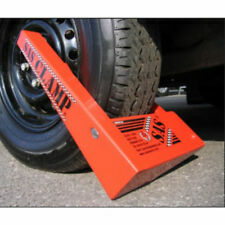 The full face wheel clamp can also be used without the wheel plate. It is ideal for most caravans, trailers, cars and trucks. 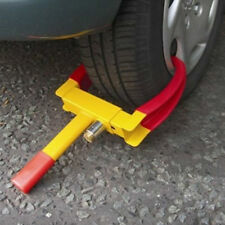 A useful wheel clamp for protecting your car, caravan, trailer etc. Wheel Clamp. Its compact size allows for easy storage when not in use. Compact size allows for east storage. Maximum Wheel Width 23cm. Heavy Duty Full Face Wheelclamp. Full Face hub cover ideal for protecting wheel nuts from theft. You do not need an existing account in order to use this service. We will always help you to have a 100% positive happy buying experience. Their economic price allows for bulk quantity buying for total forecourt protection. We will then advise you on resolving this issue, through repair where necessary. Extra heavy duty lock. 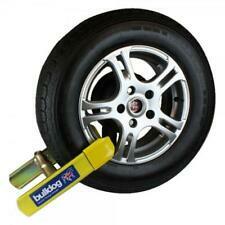 Can be fitted in seconds and lock directly onto the tyre. Quick, easy fitting security clamp. Ideal for trailer use. Anti-corrosion plate prevents access to wheel nuts for security. Pick-Resistant Lock. 2 Keys Supplied. Heavy Duty 13" - 15" Steel Car Van Wheel Clamp Safety Lock for car caravan trailer. They are high visibility orange in colour. From its central base in Colchester, Essex. • Heavy Duty Design. Designed to fit 13"- 15" wheels with a Tyre width between 185 - 215. Brand Unbranded Lock/Clamp Type Wheel Clamp Manufacturer Part Number TH03SMZJ644940008 Country/Region of Manufacture China EAN Does not apply Material Heavy Duty Steel Size 60x64x27cm(adjustable length: 33-60cm) Color Yellow Ideal for Cars, Caravans, Trailers Warranty 30 Days EAN Does not apply. 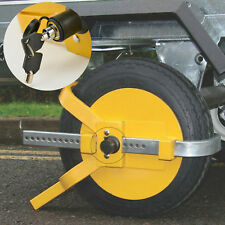 Car Van Caravan Trailer 13"-17"High Quality Wheel Clamp. High security, pick resistant lock, dust water & corrosion proof. Security plate prevents access to wheel nuts. Can be used without removing the wheel trim. Bulldog GA50 Budget Multiclamp. Complete with stainless steel padlock. Bulldog GA50 Wheel Clamp. 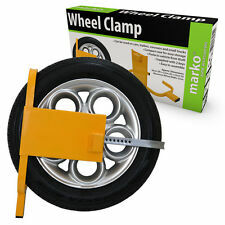 A versatile wheel clamp for caravans, trailers, cars, vans and 4x4s. Sliding Door Gear. Machine & Power Tools. The stickers are printed ontohigh grade self-adhesive vinyl using a Roland Versacamm high quality printer. Easy to apply - simply peel the backing off and apply the stickers directly to the surface, ensuring that the area is clean and free of dust and debris for best results. PURPLELINE SAMURAI & WINTERHOFF COMPLETE SECURITY SET. • Designed for use with the Winterhoff WS3000 Stabiliser. WINTERFOFF HITCHLOCK. SAMURAI WHEEL CLAMP. Saracen Hitch Locks have been developed to be quick fitting, convenient and highly secure anti-theft devices. 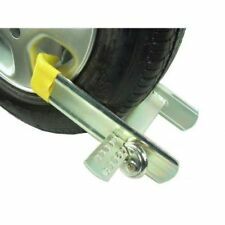 Caravan Boat Trailer 8" 9" 10" Security Strong Heavy Duty Wheel Clamp. Ideal for trailers, High security, pick resistant lock, dust, water & corrosion proof. Security plate prevents access to wheel nuts. S-A-S New Defender Wheel Clamp. Excellent Condition. Dispatched with eBay delivery – Shutl 2-3 days. A Heavy-Duty wheel lock clamp that is perfect to prevent theft of Motorcycle. The wheel lock clamp is made from heavy duty hardened steel and will prevent a wheel from rotating or turning. Need to know more about our Stickers?. Long durations, exposed to direct sunlight, could speed any natural fading of the inks. Any residue left behind from the sticker, is easily removed with household cleaning solution. 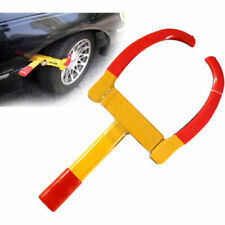 HEAVY DUTY WHEEL CLAMP 2 KEYS. Very simple and convenient set up. 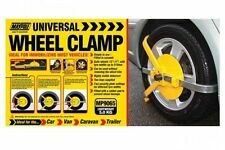 Steel Round Wheel Clamp Lock For Caravan Car Van Trailer to Fit 13"-15" Wheels. Robust clamp ideal for cars,caravans and trailers. Solid steel construction with highly visible security yellow lacquer. VOSA Style Wheel Clamp. Extra Heavy Duty. Condition is Used although very good clean condition. Very heavy. 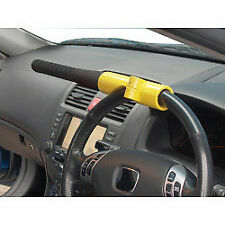 Great for securing campervan or motorhome on the drive way. 23” clear height so should suit up to a 20” wheel and Tyre. Collection only due to weight. Cash on collection also. Contact number is 07983961026. I have this advertised on fb so may be removed without notice. Practical Caravan Magazine - "A real bruiser of a Wheel Clamp the Centaurs success reflects its smart thief proof design.". High security drill and pick resistant lock. Tyre Width (including wheel trim): 175mm – 260mm. Robust clamp ideal for cars, caravans, and trailers. Here you?ll find the latest and greatest products. In other words ?. When you order from us, you?ll always get a great product at a great price. Solid steel construction with highly visible security yellow lacquer. Used, but in full working order. Condition is as in the photos. Here for sale a new but box is tatty Bulldog Titan H/D wheel clamp. Includes 2 x (M12 x 1.5) Stronghold Sold Secure Gold Approved locking wheel bolts and key. Can be used in conjunction with Stronghold hitchlocks or leg locks. Protective cap protects lock from dirt and water. 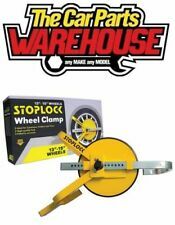 Stronghold SH5434 10" to 14" High Security Triangular Wheel Clamp. Versatile heavy duty triangulation wheel clamp. High security pick-free lock, dust, water and corrosion proof. Covers wheel nuts, wheel trims and alloy wheels. Krooklok High Security Wheel Clamp. Dispatched with eBay delivery – Shutl 2-3 days. X2 HEAVY DUTY WHEEL CLAMP 2 KEYS. Very simple and convenient set up.